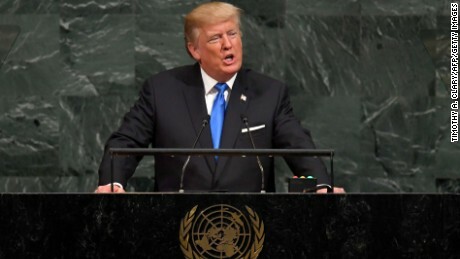 Today, President Donald Trump spoke to the United Nations (UN) for the first time. Instead of calling for unity amidst the global turmoil we all live in, Trump targeted international governments and leaders. The fiery rhetoric did not serve to assure the world, and shocked every leader in attendance. The picture of Trump's chief of staff that went viral today pretty much summed up everyone's thoughts of the speech. Other key parts of Trumps speech were when he addressed the North Korea Nuclear issue. He said "If the righteous many do not confront the wicked few, then evil will triumph," and went on to mock North Korea dictator Kim Jong Un, saying, "Rocket man is on a suicide mission." The name "Rocket Man" is a nickname for KimJong- Un, which pokes fun at the North Korean leader's recent missile tests. Most startling, Trump aggressively declared, "the United States has great strength and patience, but if it is forced to defend itself or its allies, we will have no choice but to totally destroy North Korea. "Threatening to destroy an entire country in front of an institution that was built on creating peace all over the world is ridiculous. President Trump only further proved to the world the depth of his belligerence, which is not needed when we are in a time of imminent danger. Furthermore, Trump addressed the Iran Nuclear deal as an 'embarrassment' to the United States. Back in the States, he and his aides have been in talks about declaring Iran as out of compliance with the agreement. The move will likely not only anger Iran, but the rest of the globe. This speech has been largely seen as unhinged attempt for the United States to show the world it is going back to an isolationist democracy. Still, Trump supporters loved the fact that Trump means what he says and he is not afraid to say it. There were many contradictions to his speech. President Trump spoke of national sovereignty, but kept insisting that the world needs to fix North Korea, and Iran and Venezuela. His speech, in all honesty, tried it. The president, his aides, and speechwriter, tried to appease the world while appeasing his supporters. However, you cannot appease both when they have drastically conflicting views. This United Nations speech only proved how unready and inappropriate the administration is when conducting themselves out of the country. Is The Russia Investigation Heating Up?